GULLANE, Scotland (AP) — Miguel Angel Jimenez looked like the only guy who was having fun. On a punishing day at Muirfield — the course with a reputation as the fairest links of them all — leave it to a 49-year-old Spaniard who enjoys the simple pleasures in life to make such a demanding test at the British Open seem like just another round of golf. There was calamity all around him Friday. Zach Johnson lost the lead with a three-putt from 10 feet. Brandt Snedeker, regarded as one of the best putters in golf, took four putts from 15 feet. Tiger Woods played well enough to be only one shot behind and rarely smiled. 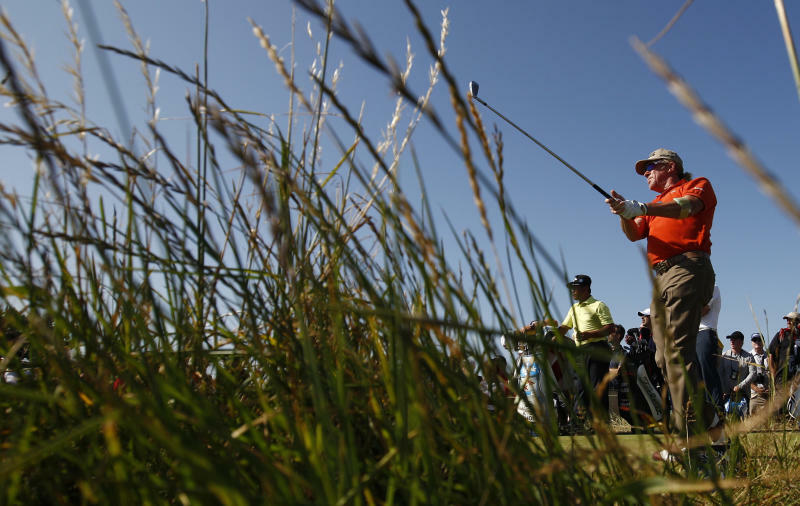 Jimenez, with his frizzy red hair bunched into a ponytail, made his way around Muirfield with only two bogeys for an even-par 71 that gave him a one-shot lead over Woods, Lee Westwood, Henrik Stenson and Dustin Johnson going into the weekend. What's a 49-year-old doing with the 36-hole lead at the British Open? "Why? I have not the right to do it? Only the young people can do it?" Jimenez said. "Why? I'm fine. We keep playing golf and still get myself on the golf course, and that's the secret. Enjoy yourself what you do in life. That's what I'm doing." For so many others, it was tough to enjoy anything about a course that brought the easterly wind for the first time all week, and greens that hit warp speed even after tournament officials hand-watered the putting surfaces overnight. 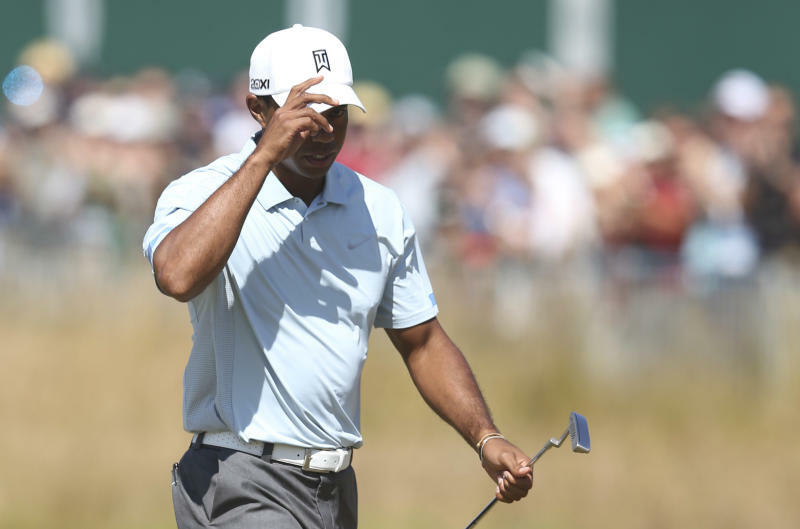 Woods went 12 holes without a birdie, saving his round with a collection of tough pars, and he finished with a 6-iron from 212 yards to 15 feet for a birdie and a 71. Westwood matched the best round of the day with a 68, while Stenson had a 70. Both of them had a double bogey on their cards. Dustin Johnson got himself into such a predicament on the 15th that his only option from a bunker was to aim sideways into the rough. He shot 72. "Every hole is playing hard," Johnson said. "You don't get any breaks. You've really got to grind it out. It's tough off the tee. It's tough on your approach shot and it's tough putting." Phil Mickelson was in range of the lead until a four-putt on the 16th hole, his second double bogey of the day. That was one hole after Mickelson made a par putt that would have gone 15 feet by if he had missed. Zach Johnson couldn't think of too many poor shots he hit in the blazing sunshine, except maybe for a pitching wedge he punched from 158 yards that bounded over the back of the 15th green. He chipped to 10 feet and took three putts from there for a double bogey, and he dropped one more shot on the final hole for a 75. "I enjoy difficult tests," said Johnson, who won the 2007 Masters in the toughest conditions at Augusta in more than 50 years. "I think everyone does. 'Fun' ... you've got to use that term loosely. What's fun about it is that we don't see this but once a year." The reference was to links golf, though such brown, brittle conditions have not been seen at the Open since Hoylake in 2006, and the greens there weren't nearly that quick. Mickelson said the Muirfield greens in these conditions were faster than Augusta. Jimenez, who was at 3-under 139, has his own definition. "The fun does not mean you have the biggest smile and start laughing all day," he said. "Fun is when you enjoy what you're doing. I play golf and I enjoy it. And it's fun to me, no? Sometimes you can see me serious because of a situation, but having fun doesn't mean that you are falling on the ground and start laughing." What about leading the British Open, with a chance at 49 to be the oldest major champion in golf history? "Then you put the smile on the face," he said. If he cared to look behind him, Jimenez might have reason to be concerned. The biggest name was Woods, already a four-time winner this year who has been steering his way around Muirfield with mainly irons that go forever on the rock-hard fairways. More ominous is that he is making so many important putts, even if they are for par. 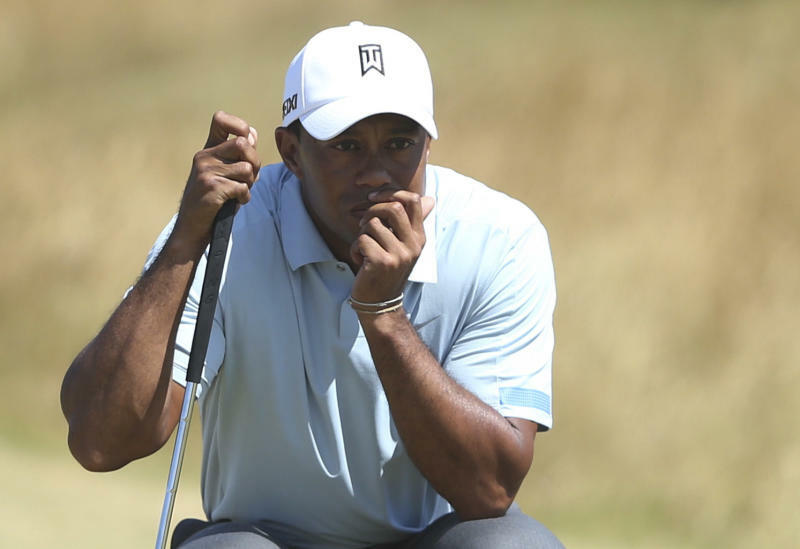 "There will be no surprise to me if he's picking up the claret jug on Sunday night," said Graeme McDowell, who played with Woods and was seven shots behind. "But I'm not writing off the rest of the field. There's quality players here in this field, and I'm certainly not writing myself off. But if he continues to play the way he's playing, he's going to be tough to beat." Westwood surged to the top of the leaderboard with a 31 on the front nine and one more birdie at the 12th, but he dropped three shots on the last six holes. Even so, he gave himself another chance to capture his first major in what already is banner sporting year for England. The last Englishman to win the British Open was Nick Faldo in 1992 at Muirfield. "Why not enjoy it out there?" Westwood said. "It's tough for everybody. So smile your way through." Angel Cabrera, among six players who had a share of the lead at one point Friday, dropped five shots over the last three holes for a 72. Even so, he was only two shots behind at 1-under 141 along with Zach Johnson, Martin Laird (71) and Rafael Cabrera-Bello (74). Only nine players remained under par on a course that is playing to an average of just under 75. Jordan Spieth, the 19-year-old Texan, was closing in on the lead until a double bogey on the 15th, followed by two more bogeys that dropped him to a 74. That still was enough to put him in the large group at 1-over 143 that included Mickelson, Masters champion Adam Scott, Bubba Watson, Ian Poulter, Charl Schwartzel and Darren Clarke, who has all but vanished since winning the claret jug two years ago at Royal St. George's. Clarke had a 71 despite a quadruple-bogey. Most players prefer a firm, fast and fiery golf course. Some of them are starting to feel burned, even Schwartzel, who had a 68. "I don't like it when it starts becoming that much luck, because that's what it is," Schwartzel said. "Because when it gets this crusty ... with 6-irons going 280 yards, how do you judge that? It becomes a bit of a lottery. You don't know what's going to happen." There were 23 players separated by only five shots going into the weekend, and 10 of them were major champions. "I think it's going to be a good test to be able to separate yourself if you're playing well," Mickelson said. "The great thing about tomorrow is that now all the players that are in contention will be on the course at the same time. And that's going to be key." Some players won't be around at all. U.S. Open champion Justin Rose shot a 77 and missed the cut. Rory McIlroy shot 40 on the front nine to take himself out of the tournament. He had a 75 for another weekend off in what is becoming a long, troublesome year. Jimenez didn't sound too worked up about the weekend, no matter what was at stake. "I don't know what's going to happen Sunday afternoon. I don't know what's going to happen tomorrow," Jimenez said. "I'm going to go now. I'm going to hit some balls. And I'm going to have a nice cigar. And when tomorrow is coming, when the sun is coming, I will deal with that then."